We are comparing the Democratic percentage of Detroit to the Democratic percentage of Dallas. What is the p-value for the .064 difference? .0344 is for one tail, so .0688 is for both tails. A statistician conducts a regression analysis and obtains a p-value of 0.1. It is more likely than not that there is a relationship between the variables in the study. A p-value of 0.1 is generally not sufficient to reject the null hypothesis, but this is only because we want a high degree of confidence before finding a relationship between variables. Here, there is most likely a relationship between the variables even though the statistician could not reject the null hypothesis. For a data set, the least-squares regression line has a confidence interval for the slope of . Based on this confidence interval, what can you do with a hypothesis test at significance level where and ? Fail to reject the null hypothesis because this confidence interval does not include . Not enough information to be able to decide. Reject the null hypothesis because this confidence interval does not include . Notice that the interval does not include . This means that the P-value for the hypothesis test would be under 5%, which would lead us to reject our null hypothesis. Any confidence interval can be used to create a hypothesis test by inverting it, and it is fairly simple, but the concept is tested into graduate-level statistics theory. Which of the following is an incorrect condition requirement for regression inference? All of the following choices are correct conditions except for the choice concerning a trend/pattern of some sort in the residual plot. For regression inference to be accurate, we need to look at the residual plot of the data of interest and make sure there is random scatter. Random scatter indicates that the ordered pairs are indeed independent of each other. Any sort of pattern present in the residual plot would not satisfy that requirement, and therefore would not enable us to successfully use regression inference. Suppose you conduct a paired -test to assess whether two group means significantly differ and find a -score of 1.645. At what alpha level would this cause you to reject the null? The critical value for a -test with alpha set to 0.10 is 1.645. Bob wants to statistically determine if the mean height of middle school boys is greater than the mean height of middle school girls. He wants to use a significance level of What must be true for him to reject . is known. Step 1: We need to use a 2-sample z test because there are 2 samples, boys and girls. The population standard deviation, , is known, so we can assume a standard distribution for each sample. Step 2: This is a one-sided z test because the questions asks if the mean height of boys is greater than the mean height of girls. Step 3: significance level, or alpha, is . This means we need a p-value less than in order to reject the null hypothesis . A z-score greater than would ensure a p-value less than . If a test has a power of , what is the probability of Type II error? From the statistical definition of power (of a test), the power is equal to where represents the Type II error. You and a classmate wanted to test the effect of sugars and fats on levels of blood sugar. Your classmate told you that they found the null hypothesis valid, which was what there is no difference between the effects of sugars and fats on blood sugar levels. If the null hypothesis was actually false, what type of error was made? A type I error occurs when the null hypothesis is valid but rejected. 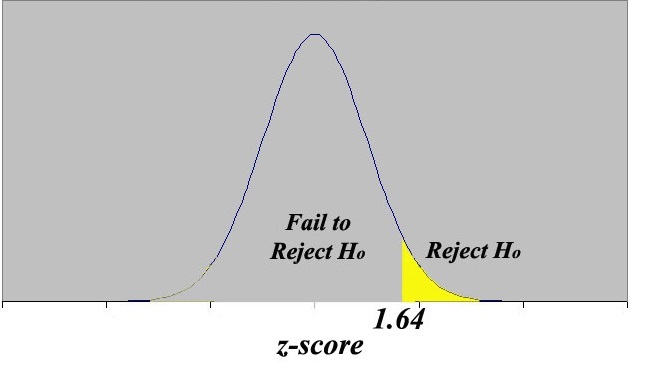 A type II error occurs when the null hypothesis is false, but fails to be rejected. Because the null hypothesis was false, but had failed to be rejected, they made a Type II error.